Everything about us is unique and you'll not find another Motel like us! It's the kind of place you'll call home with a gas BBQ grill right outside your back door and a coffee room/kitchen with free snacks. Palmantier's Motel is where you'll want to be. Our rooms are the size of a small apartment, each having it's own attached garage! All rooms are like new with many updates including new mid-size fridges, microwaves, heat/air units along with all new bathroom fixtures. 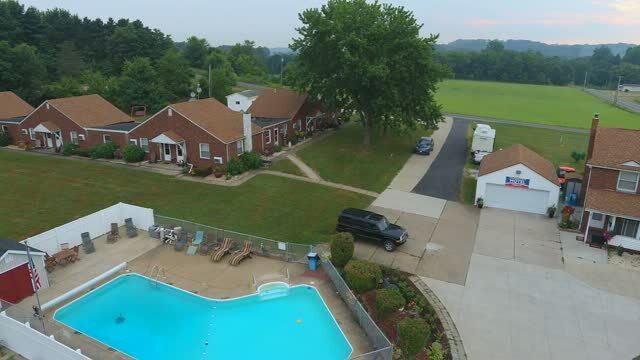 Each room has a kitchen table & chairs, large rocker/recliner, flat screen TV's with 315 premium TV channels, NFL channels, internet WiFi, two full or queen beds, (some with a third twin bed). Our rooms are all smoke free, but for those of you who do smoke you can feel free to do so in the sitting area of your own attached garage. It's a quiet country setting away from the hustle and bustle of the city, but only 20 min from The Pro Football Hall of Fame in Canton. Outside your front door you'll see the last stretch of the Baywood bricks (Lincoln Highway) leading to the new rt 30. Outside your back door you can enjoy watching the deer play in the cornfield. It's a spot where there's something for everyone. With many hunting facilities near by it makes a great place for the hunters. For the golfers, there's countless golf courses all within a few miles. It's a great location for the pipeline workers, just a few miles from all the oil-field & pipe-line jobs in Carrollton, East Rochester, Hanoverton, Mechanicstown, Kensington, Louisville, Colombiana County & Scio. Read our Reviews! They Speak for Themselves! Just click on Palmantier's Motel in the Tripadvisor box below and it'll take you to the review page. Or you can read the reviews on the review page of this website.